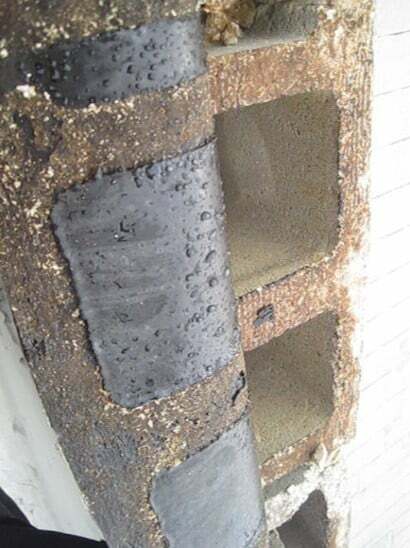 On almost a daily basis, AAA-1 Masonry & Tuckpointing receives calls from owners of newly constructed homes and buildings (i.e., structures built with concrete block or split-face block walls within the last 15 years) complaining of water leaks. Because concrete blocks are mostly hollow and are so much more porous than bricks found in older structures, wind-driven rain usually blows right through the block walls and into the wall cavity. To limit the damage due to water infiltration through block walls, waterproof membranes are usually installed at each floor in a multi-story building and at the top of the parapet wall. Unfortunately, improperly installed flashings are very, very common in new construction dwellings and fail to stop water infiltration. That's why we see water marks on ceilings, and around balcony doors and windows in so many newer homes and apartments. Water infiltrations through concrete block walls short out electrical wiring, and burn out light switches and outlets, and are a real fire hazard. At a project in West Town (see photos), we pulled back a parapet wall's improperly installed flashing to discover water all over the underside of the material it was designed to repel. No wonder the block's hollow cells were soaked and the paint on the owners' bedroom walls were peeling! Only when concrete block cells are grout-filled solid, and drip edges and membranes are sized properly and installed correctly can one be assured of a water-resistant flashing detail. All of AAA-1 Masonry's licensed masons know this. That's why after hundreds of parapet wall flashing installations we can boast a 99% success rate stopping water infiltration.